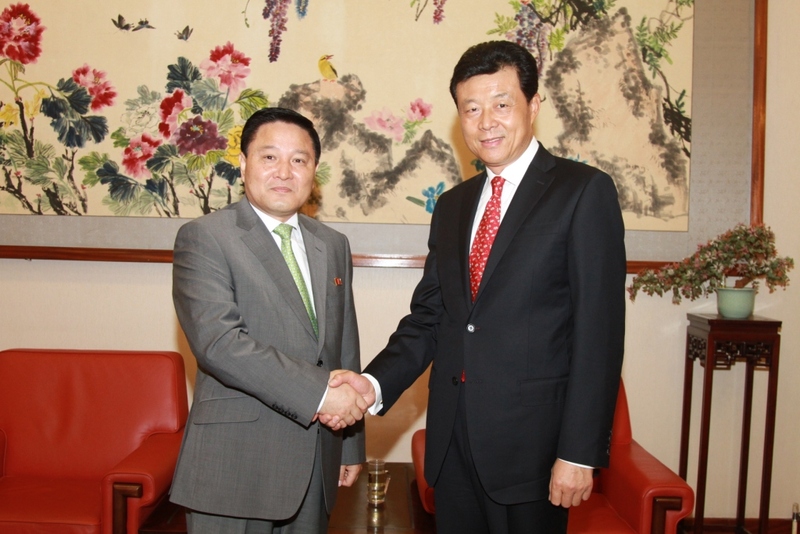 On 30 June, Ambassador Liu Xiaoming met with DPRK Ambassador to the UK Ja Song-nam at the Chinese Embassy. Ambassador Ja said that on the occasion when the Chinese people celebrate the 90th anniversary of the Communist Party of China, on behalf of the Party, government and people of the DPRK, he would like to extend the warmest festive congratulations to the Chinese people. Over the 90 years since its founding, the Communist Party of China has led the Chinese people to great achievements in both revolution and development. On these brilliant achievements the DPRK comrades feel the same pride as the Chinese comrades do. He believed and wished that under the leadership of the Communist Party of China with Mr. Hu Jintao as its General Secretary, the Chinese people would surely achieve a greater success in the cause of building a strong, modernized nation. The Party, government and people of the DPRK cherish the traditional friendship between China and the DPRK and are ready to work with China for further progress in the bilateral ties. Ambassador Liu thanked Ambassador Ja for visiting the embassy to offer congratulations. He said that the Chinese people celebrated the historic 90th anniversary of the Communist Party of China with great pride and excitement. Over the past 90 years, generations of Chinese Communists, led the Chinese people in overcoming difficulties and obstacles and achieving new victories in the historical processes of revolution, development and reform. We are confident that under the leadership of the Communist Party of China, we will write a more brilliant chapter in building the socialism with Chinese characteristics. Ambassador Liu said that China also cherishes the traditional friendship between the two countries, and is ready to work with the DPRK to implement the important consensus between the top leaders of the two countries to take China-DPRK relations further forward and deliver greater benefits to the two peoples.